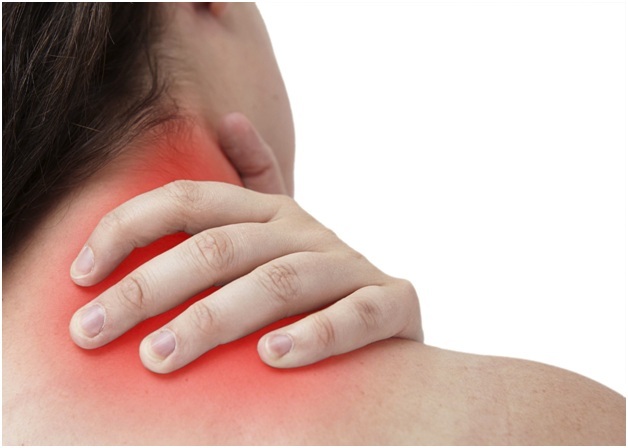 Just about everyone has suffered from neck pain one time or another in their lifetime. A simple twist of the neck is enough to cause debilitating pain and stiffness, leaving the inflicted unable to perform even the simplest of daily tasks. However, not all neck pain is the same, and since it can be caused by a number of unique conditions, its treatment will require a unique approach, as well. Following are five common causes of neck pain, along with simple tips on how to alleviate pain without the need for invasive surgery. By far the most common cause of neck pain, muscle strains and sprains are caused by a num-ber of factors, including poor posture, sports injuries, excessive stress on the neck, and holding the neck in an abnormal position for an extended period. These injuries typically occur in the levator scapula muscle, which is located at the back and side of the neck, and can lead to se-vere and chronic neck pain. Symptoms include an inability to move the neck, stiffness, inflam-mation, and pain. Muscle sprains and strains will usually go away on their own if the condition is minor; however, severe pain and stiffness may require medical assistance. The recommended course of action to relieving this pain is to stretch the muscles, decrease inflammation, and increase healthy blood flow to aid in the healing of these muscles. Non-invasive medical treatments for these types of injuries include massage and physical therapy, heat/cold therapy, anti-inflammatory medications, and chiropractic treatment. If your stiff neck is paired with a high fever, headache, vomiting, or sleepiness, it could be the result of meningitis or an infection. Meningitis is a bacterial infection that causes the protective membranes of the brain and spine to become inflamed, in turn leading to neck stiffness and pain. Although this cause of neck pain is much less common than others, it is a very serious condition that requires immediate medical attention. Since neck pain caused by meningitis is not the result of direct injury to the supporting muscles in the spine, its treatment will vary from that of a muscle strain or sprain. If your neck pain is ac-companied by any of the aforementioned symptoms, consult a medical professional immediately to rule out the possibility of a more serious medical condition. Meningitis is treated with medications, such as antibiotics, corticosteroids, and other fever-reducing drugs. Herniated discs are often associated with lower back pain, but they are also known to occur in the neck. Known as cervical disc herniation, this condition refers to a slipped or bulging spinal disc that in turn places pressure on the nearby spinal nerves. When healthy, spinal discs serve as cushioning shock absorbers, but when they become damaged, as they do in case of disc herniation, they can cause severe pain. 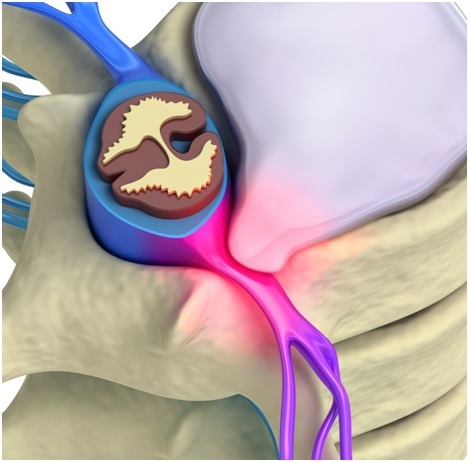 Cervical disc herniation can be the result of general wear and tear of the spinal discs, as well as an injury to the spine, which may cause tiny tears or cracks in the outer layer of the disc. It is recommended to first treat herniated discs with nonsurgical treatment, including modifying daily activity, taking medications to reduce inflammation, and performing therapeutics exercises recommended by your doctor. Your doctor may also suggest physical therapy to build the sup-porting muscles in your neck, as well as traction, which provides a gentle pulling on the head and neck to alleviate built-up pressure and relieve pain. Neck pain can also be caused by an underlying condition in the spine, one of the most common being cervical spondylosis, also known as arthritis. This pain is the result of wear and tear of the cartilage in the neck, which no longer can serve as a cushioning barrier between your spinal discs. Usually the result of aging, cervical spondylosis may occur slowly in individuals, eventually leading to severe and chronic pain if left untreated. Surgery is often prescribed for this condition, but there are also a number of non-invasive treat-ments for arthritis considered much safer and just as effective. Physical therapy is a great way to stretch and strengthen your neck muscles, in turn allowing them to better support your spine and take pressure off the deteriorating cartilage. Treatment may also include spinal traction, which involves using weights to increase the space between the cervical joints, along with chi-ropractic therapy. The most easily identifiable neck condition by sight alone, Torticollis (Wryneck) is a painfully twisted and tilted neck. This condition may be present at birth or as the result of damage to the neck muscles or their blood supply. Consequently, the neck becomes stiff and locked into a contorted position, usually leaving the inflicted unable to move their head. Chronic torticollis can cause severe and chronic neck pain, making performing daily tasks incredibly difficult. Currently, there is no solution to prevent torticollis from arising in the first place, but seeking im-mediate medical attention can stop it from aggravating. Treatments include applying heat and ice therapy, massage therapy, physical therapy, traction, and stretching exercises. These treat-ments are designed to loosen stiff muscles in your neck, alleviate stress on the supporting mus-cles, and help build the supporting muscles in the spine to avoid injury in the future. Understanding the unique cause of your neck pain is the first step to getting back to your normal life. Although many neck conditions will go away on their own, seeking non-invasive medical treatment is a safe and effective solution. If your neck pain is severe and doesn’t seem to be going away, contact Windmill Health Center for an evaluation of your condition. Dr. Marc Browner is a Co-owner and practicing chiropractor at Windmill Health Center in Weston, Florida. A graduate of the University of Florida in 1991, he earned his Doctor of Chiropractic degree from Life Chiropractic in 1995. In private practice since 1998, Dr. Browner is a member of the Florida Chiropractic Society, the Florida Chiropractic Association, and he attends continu-ing education seminars, classes, and workshops to remain abreast of the most current treat-ment methods and technological advances in the field. I read this article and found it very interesting, thought it might be something for you. The article is called 5 Common Causes of Neck Pain and How to Treat Them and is located at http://www.windmillhealthcenter.com/5-common-causes-neck-pain-treat/.